Cleaner than water and sand – but just as much fun – pasta play is a great activity for busy toddlers. Useful for mat time and any time that you need to keep little ones happily occupied. If you have trained your toddlers to stay on a designated area for blanket time (mat time) then they will happily spend time tipping, pouring, filling, scooping, posting and otherwise manipulating pasta shapes. All you need is a couple of bags of dry pasta, a variety of containers and a bunch of scoops and ladles and you are all set. Spread a sheet out on the floor to catch the dropped pasta and clean-up is a breeze. 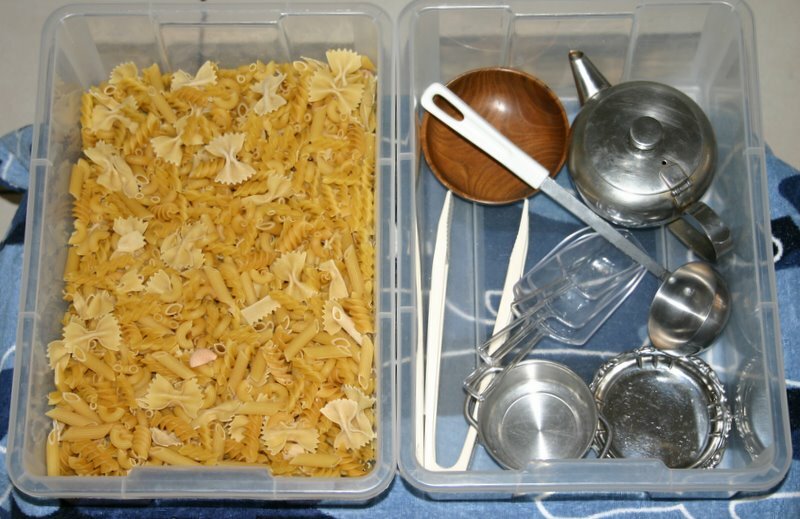 Simply collect up all the accessories into a container or tub of some sort, flick the pasta onto the sheet and pick it up by the four corners. If you will be using it regularly then find a container big enough to put the sheet bundle straight into (rather than tipping the pasta off the sheet) and you are all picked up in seconds. Of course, teaching little ones to help pack up is an important skill and if everything is being tossed into an open container then it is an easy matter for them to help you clean up. Yes, they will probably have a bit of a chew as well, but it is just pasta! Keep an eye on them as always because pasta could pose a choking hazard for toddlers but all in all, this is a very easy activity to set up and by simply changing the containers and accessories you put with it you can renew interest and keep the activity fresh. It works well as a sensory table activity and can be adapted and set up as a Montessori tray activity for practical life posting, scooping, sweeping, pouring etc. The photo above shows pasta play set up at my sensory table in two plastic crates, however for toddlers I prefer the sheet method as they tend to spread it far and wide around the sensory table.